Cat#: AA-104 Year: 2017 Price: $14. Most artists from the ’60s would be lucky to release a single, let alone issue a full-length LP documenting their musical vision. 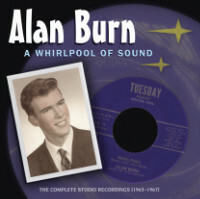 Alan Burn stands alone during that effervescent era by self-releasing a whopping eleven 7-inch singles in a mere five-year period of creativity from 1963–1967. With the exception of one major label outing produced by the New York team of Feldman, Goetther, and Goldstein (better known as the Strangeloves of “I Want Candy” fame), virtually all of his releases had no distribution and were used ultimately for the promotion of Burn’s active performance schedule in Maine and the Albany, NY region. Now, with the internet and eBay, there has been a substantial uptick of interest in Burn’s musical legacy—and rightly so—for his brilliant songwriting ability and parable-styled lyrics. Copies of these elusive vanity releases currently fetch good money on the collector’s market, and his garage/punk classic “Whirlpool” has appeared on the acclaimed Last Of The Garage Punk Unknown-Vol 2 release (Crypt 110). Throughout his active music career—when he wasn’t working as a lobsterman—Burn collaborated with legendary producer Bobby Herne (Cobras, Outside In, Flat Earth Society, Lazy Smoke, Euclid) to create an impressive musical legacy. Herne introduced Burn to various New England garage bands including the Alright Five, World of Darkness, and the Ushers, all of which provided musical backing for his records and live shows. Finally, the musical legacy of Alan Burn can be heard on this comprehensive collection of 32 songs with liner notes by Erik Lindgren, Jason Litchfield, and John Geoffrion.